Ever seen a ceiling made of 500 individually-painted, brightly coloured Japanese skateboards? Or walked through a tin fleet of origami cranes that hang in limbo? 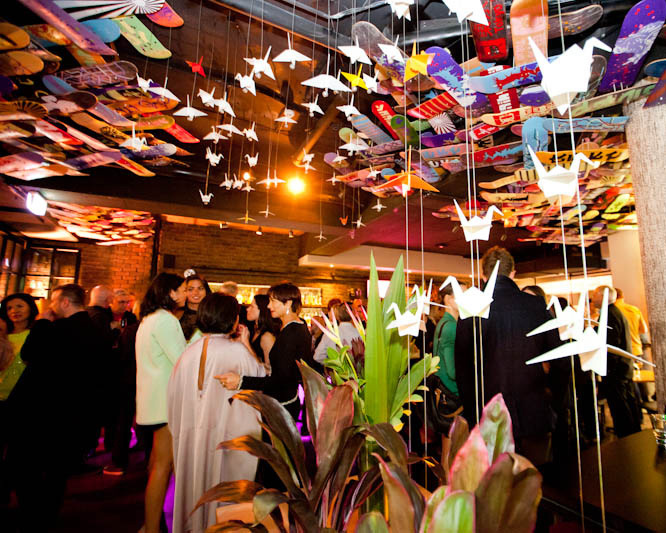 Chuck in a purple, 10-metre neon-lit bar and you have Bondi’s PaperPlanes. Hidden away from the tourist-driven chaos of Campbell Parade, PaperPlanes is the brainchild of brothers Matt, Chris and Tim Barge (of Barge8), who also own LL Wine and Dine in Potts Point, together with business partner Phil Capaldi. The restaurant design features a quirky mix of kitsch Tokyo pop culture (think Manga comics) and Bondi sass. When we walk in the doors, it’s like we’ve been transported to downtown Tokyo, but the crowd, mostly made up of Bondi’s beautiful people in all their golden-skinned, Tsubi-wearing glory, reminds us that we’re still firmly planted on Australian soil. An origami-folded menu reveals an array of modern Asian cuisine that has a clear Japanese bent. 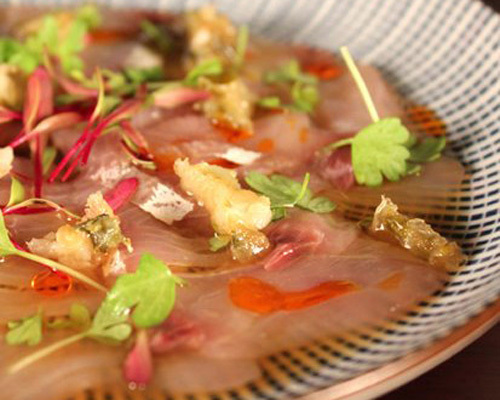 It’s been created by former LL Wine and Dine head chef, Jin Kung. For starters, the edamame is served with a seriously hot chilli sea salt and provides the perfect excuse for throwing back one of their signature cocktails – the ginger and lychee martini. A sesame seed-crusted yellow fin tuna is seared and sliced in rectangular mouthfuls, topped with a pinch of fried garlic and macro herbs. The special of the day, a pretty ceviche dish of salmon, watermelon and avocado is testament to how well Asian flavours and Australian ingredients work hand-in-hand. 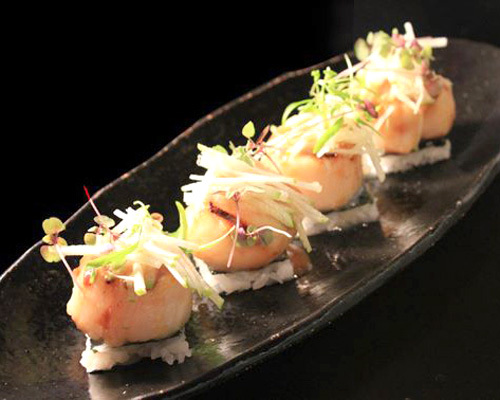 After our cold appetisers, the kushiyaki (grilled skewers) become the perfect ‘transition dish’ from entrée to main. The shiitake mushroom stuffed with a truffle and prawn butter has a curious flavour that is beguiling but it is the red miso eggplant that is truly impressive. The cubes of eggplant ooze with a salty-yet-sweet sauce and the only problem with the dish is that there just isn’t enough of it. The sake-flamed teriyaki chicken is served with sautéed white wild mushrooms, giving the dish an interesting edge that makes you wonder, why don’t more Japanese restaurants serve this? There are nine different sakes in 60-millilitre, 240-millilitre and 720-millilitre sizes, and an international wine list that spans European and South American varietals as well as Australian drops. The cocktails, however, are what you’re here for – with a range of standard concoctions, served with Asian twists like fresh yuzu, shochu and wasabi infused vodka.